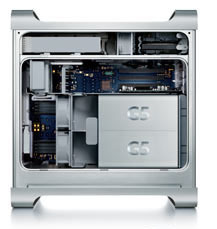 The single and dual 1.8 GHz models had four RAM slots for a maximum of 4 GB of RAM, and three 33 MHz, 64-bit PCI slots. They shipped with 256 MB of RAM, and an 80 GB hard drive. The Dual 2.0 and Dual 2.5 GHz models shipped with 512 MB of RAM. The Dual 2.5 GHz model shipped with a 128 MB ATI Radeon 9600 XTgraphics card. RAM modules for all models must be installed in matched pairs. The minimum OS for the single 1.8 GHz model was 10.3.5.
the dual 1.8 GHz model, with 256 MB of RAM and an 80 GB hard drive, sold for $1,999. 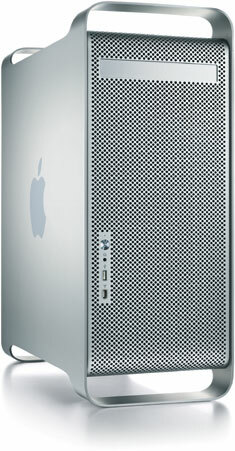 the dual 2.0 GHz model, with 512 MB of RAM and a 160 GB hard drive, sold for $2,499. the dual 2.5 GHz model, with 512 MB of RAM and a 160 GB hard drive, sold for $2,999. In October 2004, Apple added a single 1.8 GHz model, with 256 MB of RAM and an 80 GB hard drive, for $1499.